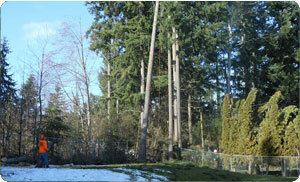 At Hunter’s Tree Service, we know that having trees on your Spanaway property can add a unique appeal to it while providing a wide range of ecological benefits like reduced temperatures, shade, fresh air, improved water table and in some cases sustenance as well. 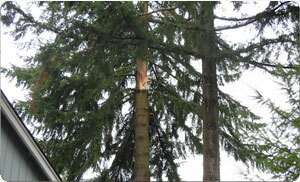 However, as with all organisms, trees face a number of natural threats towards their lifespan. These threats range from diseases, parasites, fungi and insects like termites and borers to lightning strikes and drought. Whatever be the reason for their planting or demise, once a tree is dead, it can prove to be not only an eyesore, but also a significant risk to the people in the property. Some trees can pose a threat because of their internal structural instability or propensity of the parasites and insects to spreading into and infecting the residential or commercial property the tree in question is installed on. Many Spanaway property owners choose to have the tree cut, but then will need professional tree removal services such as complete stump removal and stump grinding. Whenever Spanaway residents hire tree removal services, many times they think that the job ends with the cutting down of the tree and disposing of it. 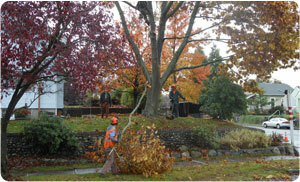 However, at Hunter’s Tree Service, we know that stump removal and stump grinding is often beyond the operational capabilities of many tree care specialists, given its requirement for a whole new set of technology and techniques. With our team of expert professional arborists, Spanaway homeowners can depend upon our tree stump removal services to get rid of these stumps from their property in a safe, efficient and affordable manner. Stump grinding is fast and efficient for any stump removal project. Hunter’s Tree Service brings the very best in tree stump removal services to the residential or commercial property owners in Spanaway. Our tree removal services include a wide variety of stump grinding equipment and the vast experience available at our disposal ensures that we can address any type of stump removal issue with ease. If your property requires tree removal services, contact Hunter’s Tree Service in order to get not only a fair and complete estimate, but also the very best tree stump removal and stump grinding service for your Spanaway property.